We spent over 40 hours researching and testing over 15 different types of wasp and hornet sprays and found that effectiveness, Spray reach, and cost were the most important factors that consumers looked for when shopping for wasp and hornet killers. The Spectracide Wasp & Hornet Killer scored high marks above the other hornet and wasp killers and is our overall top pick. The wasp and hornet killer by Spectracide gets rid of nests by killing the bees on contact. Users will have a 27 foot jet spray so you don’t have to get within danger range to kill the bees. Wasps and hornets have an inside track to the fact that most people are terrified of them and it seems they feed on that by flying right in your face sometimes. Hornets have ever been known to regular attack people without provocation. Instead of being terrorized by these annoying and scary insects, you can take control of the problem by finding an effective wasp and hornet killer that will eliminate them from your home and outdoor areas. With all of the different wasp and hornet killers on the market it can be overwhelming to try and figure out which one is the best one that will truly take care of the problem. The three top-rated wasp and hornet sprays reviewed below are at the top of the list and are all effective, quality sprays that will kill these aggressive insects. Any one of these three sprays would take care of the wasp and hornet problem around your home. Take a look at the reviews and see if any of these selections work for you. We have also provided a buying guide that will provide you with the information you need to know to understand the difference between sprays and how to determine which ones are quality products and which will not be effective in your fight against the wasps and hornets in or around your home. If you are looking for a reliable, effective way to get rid of these mean, aggressive pests, Spectracide Wasp and Hornet killer maybe just what you’re looking for. Spectracide is a fantastic brand that gets the job done and has a reputation for quality and performance. The 27 foot jet stream allows you to kill these pests without getting too close. It is specially formulated to use outside against wasps and hornets that bother you while you are enjoying your outdoor spaces. This powerful spray kills the bees on contact and will eliminate the whole colony without staining your patio or desk or the side of your home. If you have children and/or pets, you will need to use extreme care when using this spray because Spectracide is not child or pet friendly. 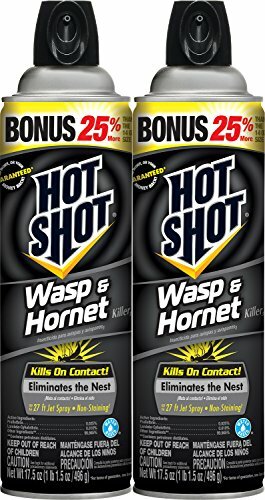 Hot Shot is another well-known name in pest control that lives up to what the brand promises which is elimination of pesky and mean wasps and hornets. In addition to eliminating bees this powerful spray will also take care of yellow jackets, scorpions, and tent caterpillars. Some wasp and hornet sprays take a little while to work but not Hot Shot. This effective spray kills on contact so you can take care of the problem with instant results. When attacking the nest make sure you spray the nest until it is soaked. Doing this ensures that even the bees that return to nest will be eliminated too. You can count on Hot Shot wasp and hornet killer to work for a few days after you have sprayed. The jet spray from this aerosol killing spray is 27 feet so you can spray from a safe distance and still be very effective at killing the bees. Hot Shot wasp and hornet spray is a water-based spray that contains non-staining properties so you can spray as needed without worrying about leaving stains behind. Use this spray outside only and do not spray it around electrical equipment. You also should avoid spraying on evergreen trees or holly since it could kill these plants and trees. The best time to use this spray is at sunset which is when the bees are the least active. If you want to be certain about not staining the siding of your home, check it out on a small area that is not visible to see how the siding reacts. Last but not least on our top three choices is another Spectracide product that is for professional use. This spray is designed to kill hornets, wasps, and yellow jackets on contact. This effective spray has a range of 20 feet so you can spray the wasps and hornets from a safe distance. SpectracidePRO kills the whole nest and will keep killing any returning bees for up to 4 weeks after you’ve sprayed. This is one of the few sprays that can be used near electrical panels due to the 47,300 volt dielectric breakdown voltage. You can use this spray outdoors in a number of places from outdoor plumbing to cracks and crevices around the home to window sills. You’ll be able to kill wasps and hornets on contact wherever you spray with its fast knockdown promise. There will be no worry about being attacked because the bees will drop and be dead long before they even know what hit them. The three top-rated wasp and hornet sprays we have featured above are excellent examples of quality sprays that will kill the bees on contact, offer powerful jet streams of 20-27 feet, and will kill the entire nest as well as returning bees after the nest is sprayed from a few days after soaking down the nest to as much as weeks if you choose SpectracidePRO. Taking the time to educate yourself about the different kinds of wasp and hornet sprays will allow you to take care of these frightening and annoying pests without putting yourself in danger from an attack. This is possible because of the “kill on contact” feature that all three selections contain. Spray the bees directly as well as the nest and they drop instantly. Make sure you soak the nest properly to kills the live bees and the ones that are away and will return to the nest later on. If you are looking for an effective way to get rid of these stinging pests, choosing one of these top sprays is the way to go. If you would like to do more shopping around, we have added 7 additional quality wasp and hornet sprays for you to consider. There are several factors that you need to look at when considering different wasp and hornet sprays. We’ve listed these important factors so you are aware of what you need to look for and ensure before purchase. Where is the nest? – If you know exactly where the wasp and hornet nests are you have a few options at your disposal to take care of them. You can use dusting or sprays which is the most common method of dealing with a bees’ nest. To kill the entire bee colony, be certain you are using a spray that will leave a residue for a time after spraying. This will also take care of any bees that will hatch soon as well as the ones that return to the nest later on. The best time to spray to get a large number all at once is in the early evening when the bees are least active. If you choose a spray that does not have a lasting residue, keep in mind that you will need to re-spray the nest and area every two weeks until they are all eliminated. If you have wasps and hornets around your home but you can’t find the nest you should spray the areas you notice them the most with a strong spray that leaves a residue. Even if it doesn’t kill them right away, it will kill them eventually if you use a lethal enough dose on them when you spray. Underground or above-ground? – It is important to use the right kind of wasp and hornet killer to effectively kill them and stop them from returning. Using the wrong kind of treatment will result in the bees not being killed and the problem continuing. If the bees have their nest above ground in the corner of a garage or overhang, in a tree, or some other outdoor, above-ground place, spraying them is easy. Keep in mind if their nest is around an electrical panel (a popular place for bees to build) you will need a special spray like SpectracidePRO that has a dielectric breakdown voltage which allows you to spray around these places without endangering your life. (you will still need to exercise caution and follow the directions on the can to the letter) If you are dealing with a nest that is underground things get a little more complicated. You may find that sprays don’t work very well for underground nests due to the fact that the long jet stream range they have, typically 20-27 feet or more, still falls short of how deep a bees’ underground nest can go. The best method to attack these underground nests is to dust the entry point with insecticides that contain carbaryl or chlorpyrifos. What type of wasps and hornets are they? – You may have multiple options available for killing wasps and hornets if you know what species and type they are. Some of these mean bees are scavengers or foragers. There are baits available that can be used in addition to the contact killing sprays or dust. Place these baits in certain places and they will eat the bait and bring it back to the nest. There are lots of wasp and hornet sprays on the market for you to choose from. Not all of them are created equally so there are good sprays and there are sprays that will do nothing more than kill a few here and there if they kill them at all. When dealing with bees that can become angry and literally attack you, you want to be sure that you are fighting them in the most effective, fast-acting manner. Take note of the following points to ensure that you choose the right spray for your needs. Jet Stream Distance – When it comes to battling a creature that can attack you and deliver potentially life-threatening stings if you or someone else dealing with the problem is allergic. The farther away you are able to stand when you are spraying the safer you will be. Several of the top rated products we reviewed have jet stream reaches of as much as 27 feet! Active Ingredients – Knowing what the active ingredients are in the spray you choose is important because it will determine its effectiveness. It will also provide you with an idea of any potential adverse effects on you, your family (including children), and your pets. Some of the ingredients used in these sprays can be carcinogenic so you will want to avoid those types of sprays for your safety and the safety of others. Dielectric breakdown – This is not applicable for every person dealing with wasps and hornets but if you have bees that have built a nest round circuit breaker boxes or some other electrical area, this will be very important information. The dielectric breakdown that is posted on a spray can is letting users know that is can be sprayed around certain electrical points providing they don’t have a potential that is lower than the number listed on the can. A good rule of thumb is to take 10,000 off the number listed to give you a margin of error. Kids and Pet safety – Wasp and hornet killers, in most cases, contain chemicals that are harmful to kids and pets. Not all of them are dangerous in this manner such as some of the eco-friendly choices available but you want to be very careful what you are spraying if you have pets and kids around. Most of these sprays note that they are intended for outdoor use only and you need to heed that word of caution. There are some that offer indoor use as well but that information will be listed on the can. In most cases you will be dealing with these pests outdoors but they can get inside occasionally through cracks in the screen or open windows and doors. To deal with the bees indoors, you will need a spray that is safe for use indoors. Residue – There are many wasp and hornet killers that leave behind a residue after you spray. This residue is very effective at killing new bees that hatch as well as any that returns to the nest after it has been sprayed. Our SpectracidePRO spray leaves a residue that lasts as long as 4 weeks after you have sprayed. The benefit of using a spray with q residue is that it does some of the work for you and prevents you from having to spray and 10-14 days. Eco-Friendly Options -There are many harsh pesticides that can be detrimental to the environment. Many bee species are in danger due to these pesticides. Make sure that you can find out how environmentally safe a specific spray is before you purchase it. There are not a lot of choices that are eco-friendly but if this is extremely important to you, there are some options out there. Dealing with any kind of insect pest is annoying enough. Add in the fear element that dealing with wasps and hornets can cause and you have a pest that needs to be eliminated as safely and quickly as possible. The purpose of this guide and the reviews of the three top-rated wasp and hornet killers we have featured is to provide you with the sprays that will get the job done as safely and quickly as possible. Bee stings can be deadly to some people that are allergic so if you have these pests flying around your home something needs to be done. All three of our top rated wasp and hornet sprays offer users a long jet stream range; one offering 20 feet and the other two offering 27 feet. These long jet stream ranges are great for those who are afraid of bees. No one wants to have to get right up close to a nest or several bees to deal with them. Any one of our featured selections will get the job done right, quickly, and with the least amount of danger for you. In addition to those reviews we have given you the information you need about what to consider and look for when you are searching through all of the choices available on the market. The type of wasps and hornets you are dealing with, where the nest is located, and other important pieces of information will make sure that you are on the right path to finding the best spray for your needs. Finding the right spray for your particular situation is very important to the success and outcome of dealing with these bees. Choosing the right spray means that you can kill them safely, continue killing those that hatch after the fact or come back to the nest, and put yourself in the least amount of danger doing it.